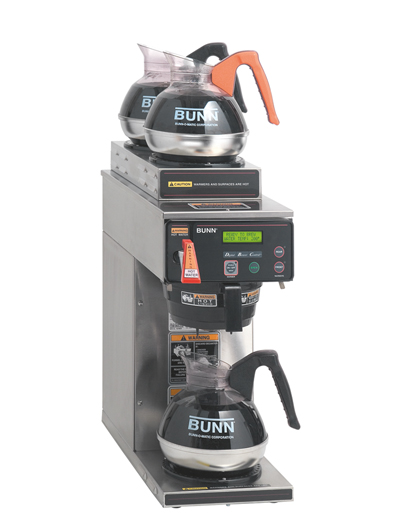 When it comes to brewing coffee, Bunn is one of the top names in the foodservice industry. They make a wide selection of high-quality coffee machines for cafes, restaurants and other commercial kitchens. Like any piece of kitchen equipment, there are can be a few quirks that pop up over time. Fortunately, our Bunn commercial coffee maker troubleshooting tips can help you identify and solve whatever is ailing your machine. Whether you have an AXIOM series machine or a satellite DBC® brewer, below are possible issues, causes and remedies to help you out. Here are some reasons why the brew cycle on your Bunn coffee maker won’t begin its cycle. No water – If you notice no water in your unit during or before the brew cycle, check the plumbing for any deficiencies or if the shut-off valves are broken or defective. Water in tank isn’t at the right temperature – Wait a few minutes to see if the temperature heats up. If it doesn’t, the brewer might have “Brew Lockout” enabled. Check your owner’s manual for disabling this function. ON/OFF switch issues – See if the switch is off, and turn it on. If it’s on, contact an authorized service technician to repair or test quickly. Faulty brew switch or valve – A broken brew switch or valve can prevent a brew cycle from starting up. Contact a certified technician to test and repair either insufficiency. Defective control board – See if there are problems with the electronic control board. Have a technician test or repair the issue. Whenever you hear strange noises coming from the machine, look for the possible causes. Plumbing lines – One of the most common causes for unusual noises is when the unit’s plumbing lines are resting on the countertop. Make sure these aren’t on the countertop during operation. Inlet solenoids – The inlet solenoids could have loose mounting screws. Tighten them accordingly. If a vibrating sound continues with these components, have it looked at by a certified technician. Incorrect water supply – First, double check that the unit is connected to the cold water. Then, see if the water pressure is correct. Water pressure to the machine shouldn’t exceed 90 PSI. You may need a regulator installed by a technician to correct the issue. Lime buildup on tank heaters – If you notice a heavy lime or scale buildup on the tank heaters, have it cleaned by an authorized technician. If water or the beverage overflows from the unit, check for the following. Incorrect filter paper – See if you’re using the right type of filter paper. The machine should only be using Bunn OEM filter paper to keep the brewing process at full speed and preventing overflow. No sprayhead – If the sprayhead on the coffee maker broke or is missing, replace it immediately. Leftover beverage in server/decanter – Make sure the brew cycle starts once the server or decanter under the funnel is empty. Leaving in coffee will cause overflowing when new beverage is brewed. 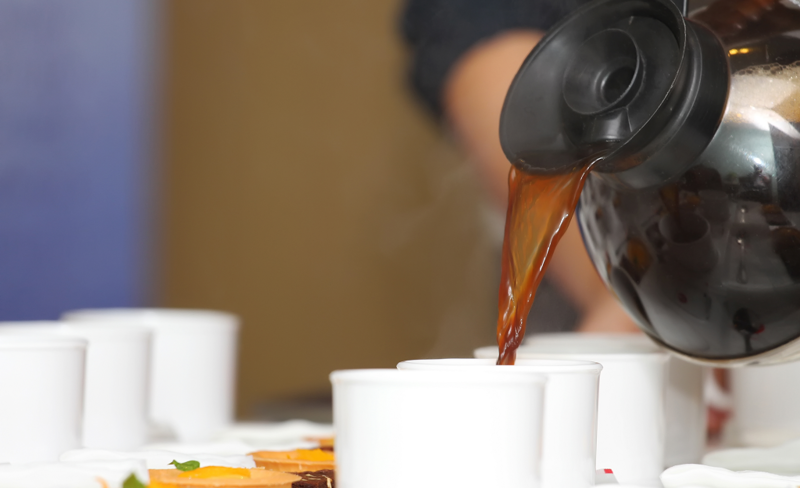 Incorrect brew volume – Adjust the unit’s brew volume to prevent overflowing. Check the owner’s manual to reach your desired brew volume during each cycle. You’ll need to calibrate the sprayhead during the adjustment. If the brewed beverage is not very strong, look for the issues below. Incorrect coffee grind – The unit should be using a sufficient amount of fine drip or grind for proper extraction and taste. Improper recipe – You might need to adjust the brew volume, perinfusion or pulse brew. Dirty or defective sprayhead – Keep the sprayhead clean or have it replaced when it’s broken. A faulty sprayhead will prevent the bed of ground coffee in the funnel from getting wet. Incorrect filter paper – Make sure you’re using the right type of filter paper. 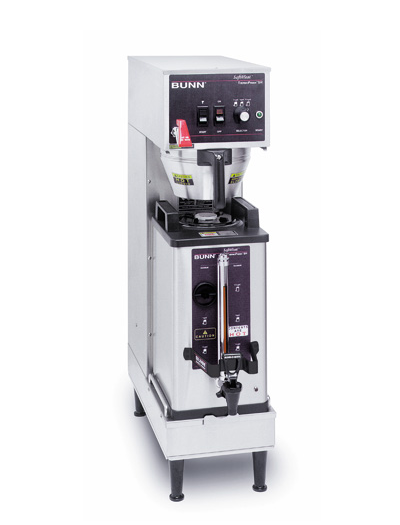 The machine should only be using Bunn OEM filter paper to keep the brewing process clean. Incorrect water temperature – When the unit is on, use a thermometer to see if the temperature is at 195° F or higher. Anything lower is incorrect during the brewing process. Funnel not loaded properly – The filter paper should be aligned in the center of the funnel with the bed of coffee grounds leveled. Level them by gently shaking. When you notice spitting or excessive amounts of steam, check for the following causes. Excessive lime buildup – If you see a large lime buildup on the tank, tank heater or temperature probe, clean the area. Refer to your owner’s manual for specific cleaning instructions. Dirty or damaged temperature probe – When the probe has too much lime buildup, descale it. If it’s broken, have it replaced by an authorized technician or service company. Faulty electronic control board – If the control board is broken or measures low or zero voltage, have it replaced by a certified technician. If the coffee maker won’t heat or takes too long to heat, the potential issues below could be the culprit. Tank heater issues – When the tank heaters fail, there could be a wiring issues or they could be broken. Have an authorized service technician repair the issue or replace them. Broken electronic control board – If the control board is defective or measuring low or zero voltage, have it replaced by a certified technician. Limit thermostat needs to be reset or replaced – The limit thermostat on the unit may need to be reset. Remove power from the brewer and reset it. Then, check for continuity through the limit thermostat. If it lacks continuity, have it replaced by a certified technician. Looking for more help troubleshooting a Bunn commercial coffee maker? Check out our collection of Bunn manuals for additional tips and instructions.